An exciting eight-week period for the sustainability universe, RecycleMania is a competition to promote waste reduction activities on campuses across the nation. 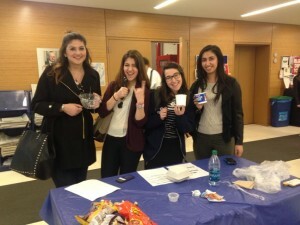 In an attempt to motivate students to increase recycling efforts, YU’s Office of Energy and Sustainability and the Eco Representatives participated in the annual campaign. Along with our fellow Eco Representatives, we sorted through bags of recycling on both campuses, as the RecycleMania competition requires our team to report the amount of recycling produced each week, university-wide. This year we came in 31st Place out of 103 in the Bottles & Cans Division, 112th Place out of 307 in the Per Capita Division, and 148th Place out of 308 in the Total Recycled Division – with a grand total of 113,493 pounds of recycled materials! Once a week, Eco Representatives grabbed their industrial scales and stopped by various bag drop off locations on each campus with a mission to weigh the recycling totals for each week. Since the garbage bags and recycling bags are piled into adjacent piles, a certain amount of sifting around garbage bags was required to weigh the recycling. Despite the bitter cold, recycling bags filled with soda bottles, salad containers, and all rigid plastic, in addition to paper materials, were sorted, weighed, and tallied. The beginning of this year’s RecycleMania yielded lower results than expected, but thanks to streamlining communication efforts with facilities and a wave of sustainability and recycling awareness campaigns on campus – featuring fun tabling displays and interactive recycling activities – the numbers greatly improved. A major issue facing Yeshiva University is that a lot of people are unaware as to what is or isn’t recyclable in New York City, and in turn throw away many items that are actually recyclable. While there are easy-to-read charts and videos showing what is or is not recyclable, it is often easier to give tangible examples that a student might encounter on a day-to-day basis. For plastic recyclables, all hard, rigid plastic – that’s your salad containers (because of the cleaning process taking place at recycling facilities, they do not need to be 100% clean), sushi containers, forks, knives, and spoons. Plastic recycling can be placed in the marked blue bins, and while the coke bottle shaped containers feature lids which are only equipped to receive bottles, the bins can actually take salad containers, and all the other things mentioned above. It’s as easy as simply lifting the lid and placing all larger items inside. Most universities have specific plastic bins, equipped for all types of plastics that are not just bottles, making recycling more of a natural and less awkward process; unfortunately, due to budgetary concerns and lack of interest, Yeshiva University falls behind other universities, with the few bins set aside for plastic divided between the blue bottle bin containers and the free ones provided by the Coca-Cola Company. All said and done, RecycleMania is an important time of year because it brings campus recycling issues to the forefront, which should spark a sense of general awareness beyond even those of sustainability and the future of our planet. For us, recycling, beyond the environmental and financial benefits, raises an element of awareness that reminds us of our surroundings, and the stories of everything we use. Where did this salad container come from, where will it go once we toss it away, and who is the Eco Representative weighing it?